Teachers have long been blasted in the media for common misconceptions about the teaching profession. While teachers know the truth, it seems that the public has turned a blind eye to the amount of work, continuing education, and paperwork that teachers are expected to do. No longer just about lessons and activities, the field of teaching has morphed into a profession with unrealistic accountability and work standards. Teachers are evaluated by students, on test scores (where students often cannot use their accommodations), and more. No, teaching is truly not what it once was. In fact, whoever said that teaching is easy has never taught. While it is one of the most rewarding professions, it is also one of the most challenging. We asked Really Good Teachers to help dispel the myths and asked them what the top myths are about teaching. Myth #1: Teachers get three months off every summer. Fact: Teachers plan and work all summer long. Myth #2: Teachers work from 8am to 3pm and never work weekends. Fact: Teachers often work long into the night and dedicate at least one weekend day (if not both!) to planning, grading, and preparation. Myth #3: Teachers get paid vacations. Fact: Teachers get paid for the school year only. Many opt to have their paychecks broken down into equal installments over a 52 week period, so that they will still receive income during the summer months. Myth #4: Teachers sit behind a desk all day. Fact: Teachers move around the classroom, sit on the floor, walk around the playground, and spend the majority of the day on their feet. Myth #5: Teaching is easy. Fact: Teaching is one of the most challenging professions around. It requires constant professional development, adaptation, and learning. Myth #6: Teachers build up a tolerance for every germ and virus and do not get sick after teaching a few years. Fact: Teachers get sick too! Myth #7: Teachers do nothing except play with the students all day. Fact: If teaching, guiding, planning, grading, assessing, accommodating, managing, and evaluating are your idea of play, then yes, teachers play all day long. Myth #8: Anyone can be a teacher. Fact: Not everyone has the patience, creativity, dedication, and love for teaching and children that teachers have. Anyone can spew out facts, but few can be called a teacher. Myth #9: Teachers do not have to go back to school after they have their teaching degree. Fact: In order to retain their teaching certificates, teachers must obtain graduate level credit, as well as hours of professional development each year. Teachers never stop learning. Myth #10: All Kindergarten teachers do is color and nap. Fact: Kindergarten teachers lay the foundation for learning. Reading skills, math skills, social development, as well as science, social studies, art, gross and fine motor skill development, and so much more rest on a Kindergarten teacher’s shoulders. While she may need a nap, she certainly doesn’t get one at school! Myth #11: Those who can – do. Those who can’t – teach. Fact: Those who can, teach. They make all other professions possible by giving others the tools and information that they need in order to succeed. Teaching is an undervalued, but highly specialized field. Myth #12: Teachers are overpaid. Fact: The national average starting salary for a teacher is $36,141, however the national starting salary average for a college graduate with a bachelor’s degree is $45,000 and business majors start at $54,000. Myth #13: Teachers can do everything. Fact: While teachers have a wide range of skill sets, no one can do all things. Teachers do not have the time to do everything asked of them within their contract hours. Myth #14: There are always a lot of teaching jobs available. Fact: This may have been the case at one time, but teaching is a highly competitive field and jobs are often scarce. 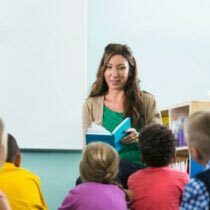 Finding a full-time teaching position in some states, especially in the Northeast part of the country, can take many years. Myth #15: Teachers collect unemployment over the summer. Fact: Teachers do not collect unemployment over the summer. Many elect to have their contract pay spread out over the course of 12 months rather than just the time that they’re in school so that they will receive a paycheck during the summer months. Myth #16: Teachers have a lot of extra time during the day. Fact: Teachers have so little free time during the day that they often do not get lunch or bathroom breaks. From the moment the first student arrives until the moment the last student leaves, teachers are focused on their classroom. Myth #17: Students always behave. Myth #18: Students always master things the first time you teach them. Fact: Repetition and review are key to learning. It often takes 4-7 times of being exposed to a concept before a student grasps it. Myth #19: There is no need to plan – especially if you teach Kindergarten. Fact: Planning is essential no matter what grade or subject is being taught. In fact, teachers often spend 2-3 hours a week planning and preparing for upcoming lessons. Myth #20: Everything teachers need to teach is provided for them. They have no out-of-pocket expenses. Fact: If they are lucky, teachers are given a stipend of $100 to spend on materials for their classroom. In many schools, they are allotted a box of copy paper, a few boxes of pencils, furniture, and text books. Classroom library books, decorations, folders, notebooks, crayons, markers, colored pencils, center supplies, clipboards, pencil sharpeners, etc. are all purchased by teachers for their classrooms. There’s a saying that teaching is the only profession where you steal office supplies from home to bring to work and it’s true. Teachers spend hundreds of dollars each year on supplies for their classrooms. Myth #21: All teachers have loads of patience. Fact: All teachers have patience, but they are also human. There are good days and bad days. Days where patience runs low and days where they’ve been able to have an adequate amount of coffee and sleep and have a bit more patience. Teachers are human. What are other myths about teaching? Share them with us below! Thank you for demystifying these myths. Teachers get too much increase. Teachers don’t want to get married. Teachers want their private life exposed. Teachers in parochial schools are there because they couldn’t get a job at a public school. Money isn’t everything! Teachers get a lunch hour. Try 30min.